Master of Arts and Master of Science students. Student must be fully admitted to a degree program before this form is submitted. Must have advisory committee form submitted before or with this program of study. Should be submitted by the second quarter/semester of residence, but must be submitted by Friday of the Second full week of classes (first week for Summer) of the semester in which the student intends to graduate. Courses should be listed in order taken. The program must list at least 12 semester hours of credit (exclusive of 7000 and 7300) in courses open only to graduate students. A maximum of six semester hours of 7000 may be applied toward the minimum of 30 semester hours listed on the program of study. Minimum number of thesis hours (7300) is 3 semester hours. Designate by asterisk 6000- and 7000-level courses open only to graduate students, exclusive of research and thesis hours. Undergraduate courses may only be listed on Departmental Requirements. No grade below “C” is acceptable for a course included on a program of study. Make sure the advisory committee signing the form is the same one on record in the Graduate School or send a revised advisory committee form. No courses used for another degree may be listed. Master of Environmental Planning and Design, Master of Historic Preservation, Master of Landscape Architecture, and Master of Laws. Students must be fully admitted to a degree program before this form is submitted. Should be submitted by Friday of the second full week of classes (first week for Summer) in the semester the student intends to graduate. Undergraduate courses may be listed only on “Departmental Requirements”. No grade below a “C” is acceptable for a course included on a program of study. To be eligible to graduate, a student must maintain a 3.0 average on all courses in the Program of Study and on all graduate courses taken. Specialist in Education, Master of Education, Master of Accountancy, Master of Agricultural Business, Master of Agricultural Economics, Master of Agricultural Leadership, Master of Animal and Dairy Science, Master of Applied Mathematical Science, Master of Art Education, Master of Avian Medicine, Master of Biomanufacturing and Bioprocessing, Master of Business Administration, Master of Crop and Soil Science, Master of Environmental Planning and Design, Master of Family and Consumer Sciences, Master of Fine Arts, Master of Food Animal Medicine, Master of Food Technology, Master of Forest Resources, Master of International Policy, Master of Internet Technology, Master of Marketing Research, Master of Music, Master of Music Education, Master of Natural Resources, Master of Plant Protection and Pest Management, Master of Public Administration, Master of Public Health, and Master of Social Work. Must be submitted no later than Friday of the second full week of classes (first week for Summer) of the semester the student intends to graduate, but can be submitted as early as the second semester of residence. Student must be fully admitted to a degree program before this form is submitted. No grade below a “C” should be listed on the Program of Study. No undergraduate courses may be listed except as departmental requirements. To be eligible for graduation, a student must maintain a 3.0 average on all graduate courses taken, and on all courses on the program of study. A preliminary program of study, developed by the major professor and the doctoral student and approved by a majority of the advisory committee, will be submitted to the graduate coordinator by the end of the student’s first year of residence. The program of study should constitute a logical whole and consist primarily of 800/8000- and 900/9000-level courses in addition to research. This form is for departmental use only and should NOT be sent to the Graduate School. Must have advisory committee form submitted before or with this program of study. Should be submitted in the first year of residency, but must be submitted by the time oral comprehensive examinations are scheduled. Courses should be listed in the order taken. Doctoral students can transfer in 9 semester hours of courses taken at another institution. 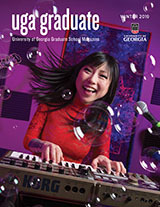 No courses taken prior to the student’s admission to their degree program at the University of Georgia are eligible for transfer. A minimum of three semester hours of 9300 must be included on the program of study.